In a Bloomberg Businessweek Research Services report titled “Six Essentials for a Strong Customer Experience,” it states, “No matter how customers choose to transact or engage with a business, they now expect and deserve to get the same answers, information and treatment wherever they go.” This finding holds true for business-to-consumer as well as business-to-business buyers. 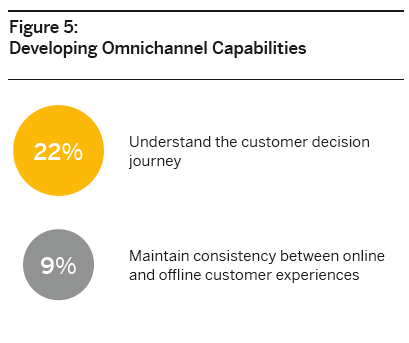 However, creating these omnichannel experiences is still a significant challenge. One complication is not having the insights into what the targeted buyers want or need. Without the insights, crafting meaningful communications is hit or miss at best. In addition, as marketers, we often don’t know the profile of the current customer base; who are the good, the better and the best buyers? How can we use current customer insights to drive communications to new customers? The hurdle to understanding existing customers is often the result of the arm’s-length relationship between sales and marketing. According to SAP, in its study titled “The DNA of a Growth CMO,” growth CMOs are focused on overcoming the lack of customer insight and improving omnichannel communications. However, reaching these goals is going to take time, since only 22 percent of the CMOs surveyed felt they understood the customer decision journey, and even fewer, 9 percent, were able to maintain consistency between online and offline customer experiences. The obvious challenge is how to get there faster. All prospects and current customers are not created equal. Most companies report the 80/20 rule when it comes to the value different customers bring to the table; about 20 percent of the customers contribute to 80 percent of the revenue. So our challenge as marketers is less about getting more prospects any way we can. Rather, it is how to get more of those high-value 20 percent customers. Loyalty Research Center has a model to tackle the problem for better understanding the current customer base and how to use the insights to drive better experiences for customers. The model is particularly helpful for marketers. At its core is the segmentation of the customer base by strength of relationship – aka “loyalty” – that, in turn, is driven by the total customer experience. This means that the stronger the relationship, the more valuable the customer. Insights into what makes for a strong relationship helps marketers create communications to attract new customers, retain existing high-value/best customers and move the good/better customers into more valued customer segments. As opposed to the Net Promoter Score, the power of Loyalty Research Center’s model lies in its cognition of the competitive environment in which the relationship thrives. Loyalty is then an acid-test measure of what is driving the choice among multiple offerings. The Loyalty Research Center has further developed customized financial impact models that accurately measure the likely implications of strategic choices buyers are making. Insights from the research can empower marketers to develop targeted messaging for current customers and prospects. The table below serves as an example of the type of insights the model reveals and the accompanying analytics. A research program at this company identified “New Products” and “Consultative Services” as critical relationship triggers that were essential to growth. However, it also revealed that client performance fell short in both areas. This discovery was creating poor customer experiences and holding back the company from realizing its full growth potential. It was important to make improvements in those areas before more completely incorporating them in marketing programs. The final piece of the puzzle is learning where buyers seek information as well as the type/format of the information they prefer. This information is used to craft the buyer journey. Communications are created and executed using insights from the financial models. Analysis of the programs/communications are conducted on a regular basis and changes/modifications made to optimize results. These combined efforts of financial insights and buyer behavior can help any marketer get a head start on executing and managing successful omnichannel programs. Learn more must-haves to B-to-B success. Register for the October 29 gyro/Loyalty Research Center webinar, “The Path of the Growth CMO: From Insights to Tangible Results,” to learn about a customer valuation model using customer intelligence data you may already have available to drive insights that can make lead generation and customer retention measurable. As an account planner, Carolyn is responsible conducting research projects, developing strategic insights, facilitating ideation sessions and workshops related to process improvement, new product development, campaign strategy, defining analytics and metrics for clients, and working with agency teams to develop campaign strategies and tactics that resonate with customers. Carolyn has been working with the world’s top brands for over 20 years. She has conducted complex research that drives brand messaging and tactical planning. She has developed segmentation programs for B-to-B companies that rely on brokers, deals and/or distributors to sell their products and solutions. Carolyn is passionate about leveraging digital strategy and tactics to drive results. At gyro, she is one of the leaders in digital marketing communications.